Time for another update from New Zealand. A lot has happened in the past few days! Sunday was the middle distance, held in a really tricky sand dune area. They started us of with a few straightforward controls in the forest and then straight into the really complicated dunes, where it was hard to even make a plan to find the control! There were some huge mistakes made during this race! 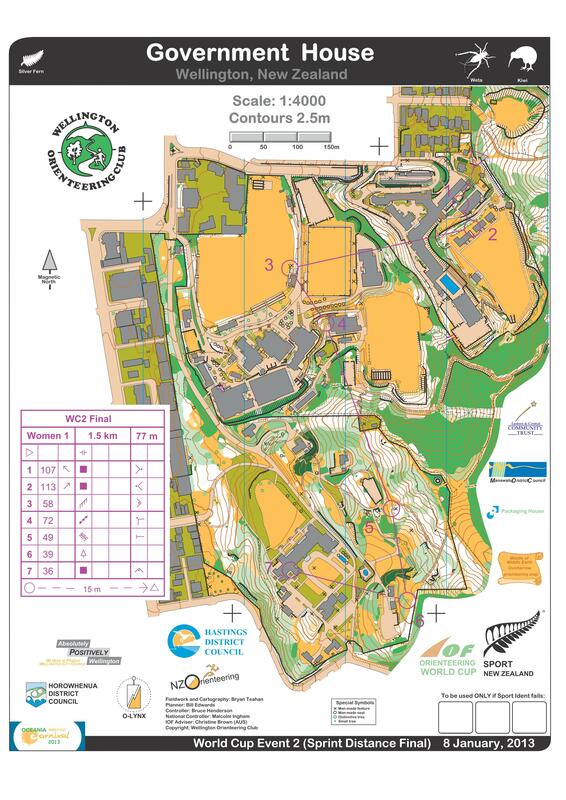 Monday was the sprint qualification, held on the grounds of the New Zealand Parliament in Wellington. It was a very fun, quite tricky (or so we thought) sprint with some good route choices. Unfortunately, we both missed qualifying for the final, with Will on some 20 seconds out. Tuesday was the sprint final. We were able to watch the World Cup runners first before running the same course ourselves later. It was fantastic to watch Lizzie Ingham finish with a bronze medal in her home city! We were very privileged to run on the grounds of Government House; the organizers said that was a first and probably a last. Although during the race we barely noticed where we were. This was the probably the most physical sprint I've ever done and definitely the one with the toughest route choices. Have a look at the map and think about what you'd do! Today we spent resting and visiting Wellington. We're off to Masterton for a long race tomorrow (not a World Cup) and then the chasing start World Cup in Hawke's Bay on Sunday. Stay tuned! All maps can be found here. It's currently -17 in Moncton, New Brunswick, but Will and I are enjoying the sunny, warm New Zealand summer. Yay for sunshine, fresh corn and strawberries! We arrived in Auckland on January 1st. I just completely skipped New Year's Eve and went straight from January 30th in California to New Year's Day in New Zealand. We were hosted by the very welcoming Smith Family in Auckland for two days, where we had a chance to explore Auckland's sites and a couple park maps. On Thursday we found a car and joined forces with Helen Palmer (GB) for the drive to Palmerston North. On the way we stopped at the scenic Lake Taupo for a picnic and a run out to Huka Falls. Today we went and ran the first public race, which was fantastic open, intricate sand dune terrain. It's very exciting; there are so many really fast orienteers here! Look for us in the first World Cup middle race on Monday. The first start is 9:30am local time which is 3:30pm EST (on Sunday!). PS: Our favourite New Zealand road sign so far is when entering the town of Bulls: "Have you herd of Bulls ... A town like no udder"!